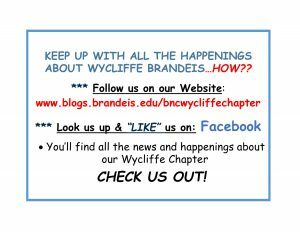 Welcome to the Brandeis National Committee Wycliffe chapter! BNC Wycliffe is an active group of men and women from the Wycliffe area who are passionate about lifelong learning, academic excellence, and their communities. We provide our members with opportunities to fulfill all these interests and more through our study groups, special events, and community service projects. 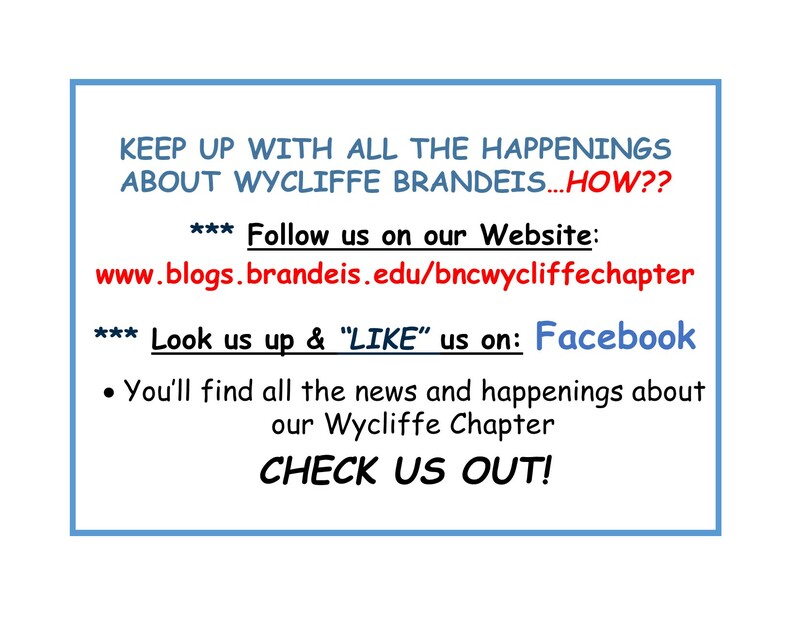 BNC Wycliffe also plays an important part in supporting Brandeis University. Throughout the year the proceeds from various events will go towards benefiting Brandeis’ libraries, scholarships, and scientific research. While some of our members are Brandeis alumni or family members of alumni there is no required Brandeis association to become a member of BNC Wycliffe. Many of our members have no affiliation with the school, but join BNC Wycliffe because of the values it espouses. Holding with Brandeis University’s belief in lifelong learning, BNC Wycliffe offers our members access to many study groups and educational events. These are designed to entertain, inform, provoke discussion, encourage friendships, and be fun. Study groups and events span a wide range of topics in order to ensure there is something for everyone. In past years these have included music, literature, art appreciation, current affairs, and trips to local attractions. We are always on the search for new and exciting topics to explore with our members. The chapter periodically publishes a bulletin containing event details, contact information, forms and chapter news. We look forward to getting to know new members and reconnecting with returning members for another wonderful BNC year!